sometimes work can even be creative and rewarding! Anyone who knows me will probably think that I'm being sarcastic in the last point, but I'm not! 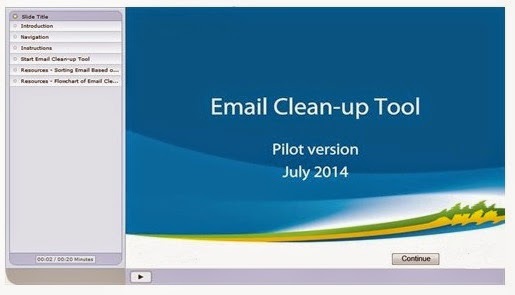 In my other life, I occasionally get to be creative and this week was the launch of an elearning tool I developed. It's still in "pilot" mode, but it's my baby out there - as much as all the quilts I create are my babies! This project has a lot of similarities to many of my quilting projects: I started it over a year ago; it's evolved in so many ways; at times I didn't think I would ever work through the challenges, or would ever get it "right or good enough"; but it's finally out there! Just for the heck of it, here's a picture of the tool, even if I've removed our organisational identifiers. If anyone is interested in learning more about the design part of the project (and what I learned), I'll be writing a post about it in my Learning & Design blog.When it's done, I'll link to it. So, all of this intro to say that I did get a little bit of quilting done, but not as much as I would have liked. Here's a WIP (work in progress) that I want to post for Needle and Thread Thursday at Kelly's My Quilt Infatuation. 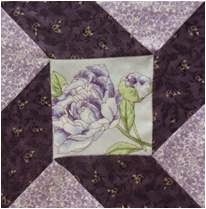 Check out the lovely quilts linked to her blog. When my energy is low, I can sew simple things together. This is what I did! I started this project about 2 years ago. It was the other half of my Scrap Happy Quilt project. When I started it, the only way my mind could get around creating the triangles required for this quilt was to create a square of strip fabrics and then cut the square into 4 triangles (just like you do to make half or quarter triangles - see picture). 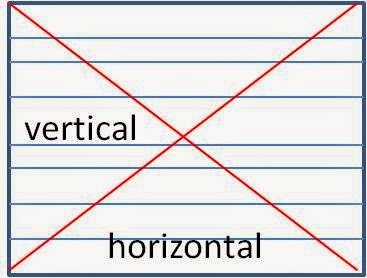 I now realise that I could have made strip rectangles and then used a triangle-ruler to cut the strips. I just wasn't getting the concept at the time, so I made enough squares for two quilts! So, a year after the first quilt made it to Denmark, I went back to the second quilt. You'll notice that the pattern is very different from the first one because in the first quilt, I used the vertical strips to make the blocks while in this quilt, the horizontal strips form the pattern for the block. The second quilt is also a little bigger. I wanted it to fit on our double bed in the spare bedroom. 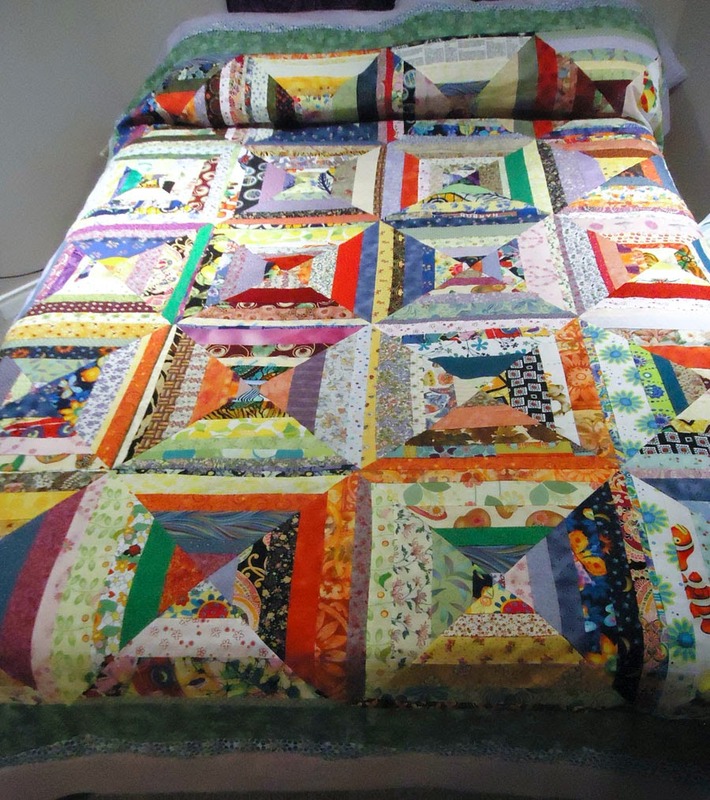 After adding the three strips for the border, I tried it on the bed. Too bad it's not quilted, because it's the perfect size and it would have stayed there! I've decided to quilt this project using heavier batting. Generally I prefer very light weight batting - mostly because most of my quilts are lap quilts and they don't really need a lot of added weight or warmth. This quilt will be in the basement bedroom, where it's always a little cooler, perfect for a warmer and slightly heavier quilt to snuggle under. I'm glad that I made two quilts out of these blocks, but it's not necessary and now that I know how to use a triangle ruler, it'll make creating these blocks much simpler. 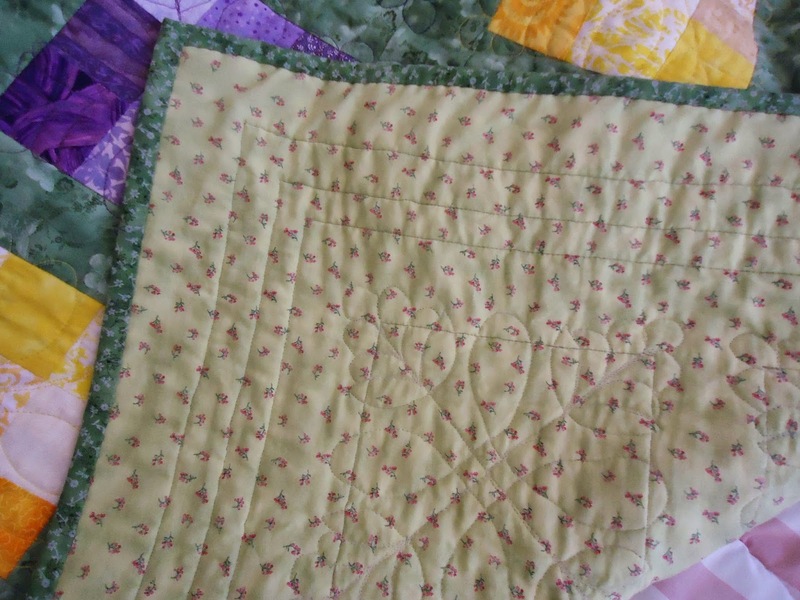 The first quilt had a lovely backing, but it look a while longer to make. 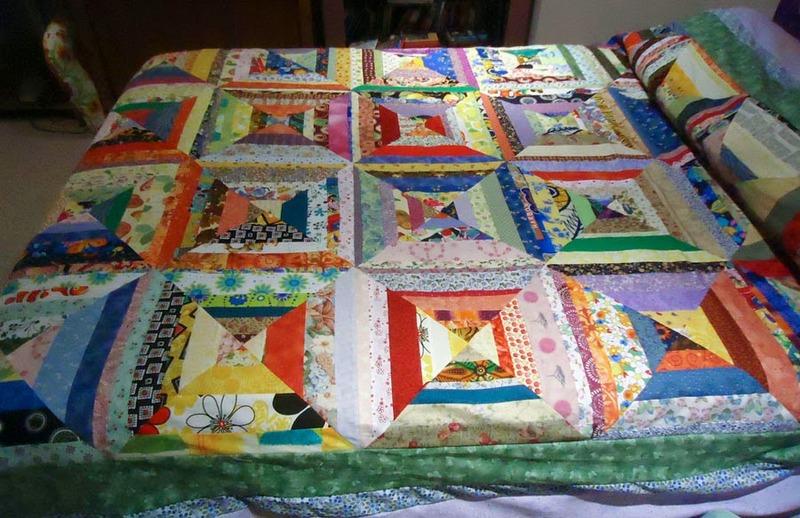 Since I would like to have this quilt on the bed before winter, I'm going to keep the backing and quilting simple so that I can quilt it quickly, without needing a huge amount of energy to tackle it! Projects requiring low energy are fun and can also be lovely! I had the most amazing weekend. At the last minute my husband decided to visit his sick brother and so we flew from Ottawa to Vancouver for a long weekend. As you can imagine, my brother-in-law was so happy to see him. We were last there about 5 or 6 years ago with our children. This time it was a short and sweet visit with loved ones. We had a wonderful time reconnecting. Several months ago, I decided that one of the quilts I've been working on would go to my brother-in-law and his family; Rob, Simone and Maddie. 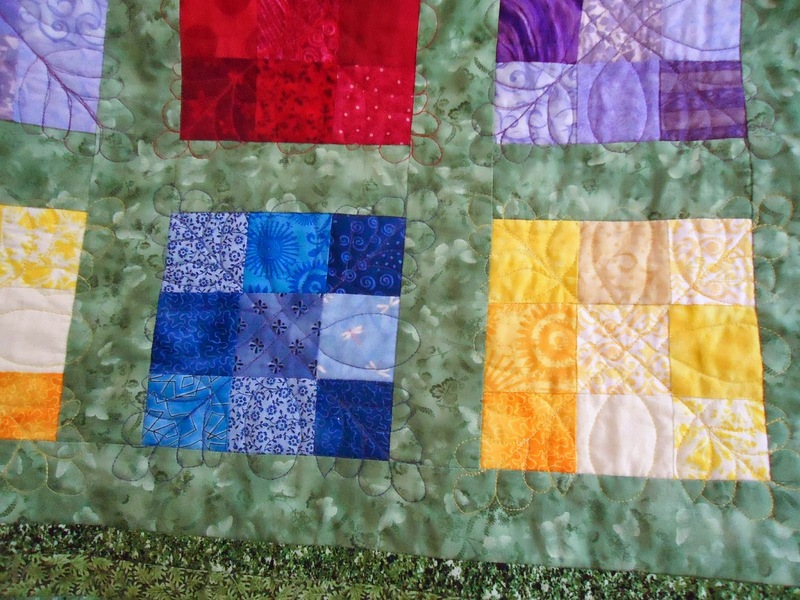 When I asked Simone a few years back about her quilt preferences, she mentioned jewel tones. 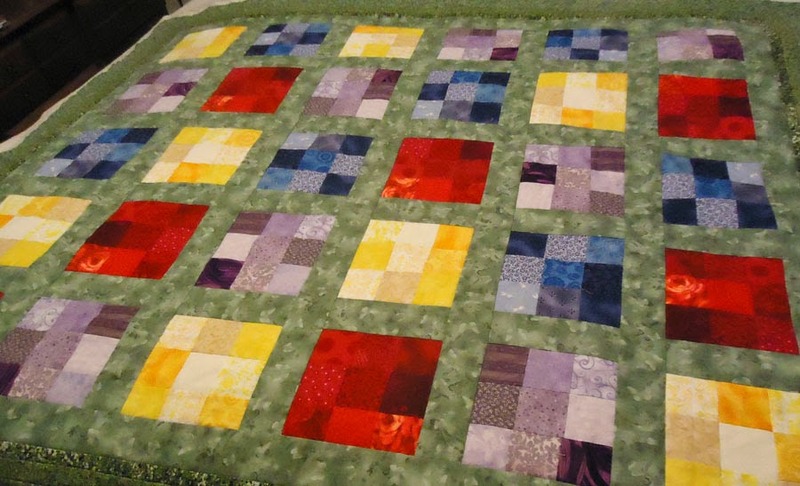 This winter, as I'm getting ready to start quilting this piece that I had started in the winter of 2011, I realised that it was in jewel tones and the perfect quilt for them. I had just emailed Simone that I would be finishing the quilt shortly and mailing it when we decided to visit. Thank goodness I only had to finish binding it! As usual, this piece was quilted as a learning project for Cindy Needham's Design it, Quilt it: Free-Form Techniques course on Craftsy. I started quilting it as she advised - "stitch every stinking seam" and stitched most of the seams except for the 9 patch blocks. (See MakingProgress post.) I knew that I would be using a template to quilt motifs within them. Before taking Cindy's course, I would never have used a 7 inch template on a 6 inch square but the pattern going out of the square adds depth (and I didn't have to quilt the sashing!!!). I considered quilting the border but since we ended up leaving for Vancouver (and honestly, after quilting 30 blocks, I was tired!) the borders are just stitched-in-the-ditch. Thank goodness for all that pre-work before the final quilting. I love the feathers in this motif - even if I didn't realise that they were feathers until I was almost done. After I finished, I watched Cindy's next lesson on quilting feathers....I sure wish I had watched it BEFORE I quilted these. It would of helped. The look on Maddie's face as she examined the quilt was priceless. She slept with the quilt while we were there. I had to make her promise that she would share the quilt with her mother and father, at least a little bit! I had a little bit of tension problems with my red and blue threads. I changed my bobbin, needle and thread as well as adjusting the tension. I got it down to an acceptable level but I'm thinking that it might be time for a machine tune-up and cleaning. I've put a lot of mileage on my Jag since I got her. Cindy has some great ideas for working on feathers - I can't wait to practice them. 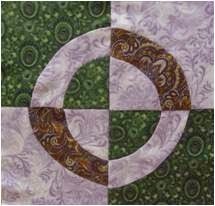 It's very cool to quilt outside the box (of nine-patch)! 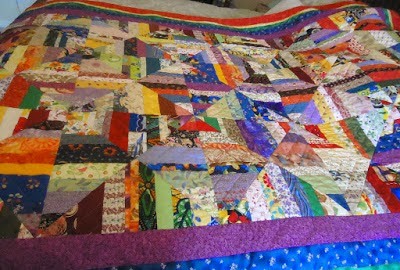 There is nothing in the world more wonderful to a quilter than giving a quilt that is going to be loved. Thanks Maddie! 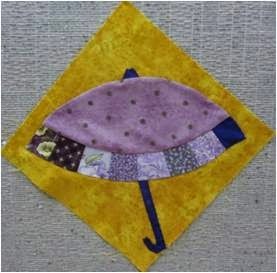 This was posted on Fabric Tuesday at Quilt Story. See what others are working on! I'm not sure if other quilters feel this way, but I tend to stick to things that I know and feel comfortable making. Although I love to try new techniques, I often need extra energy and courage to start. For example, most of the blocks that I've made to date for my Grandmother'sChoice quilt are pieced. For you non-quilters, a pieced block generally means that we cut the various pieces of fabric we need and then sew them together. The pieces are generally rectangles, squares or triangles in different sizes. 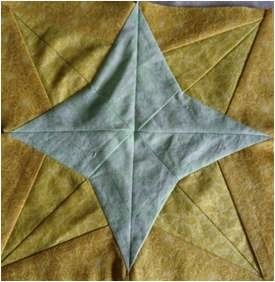 We sew them together to make a specific pattern or block. If the pieces are other shapes, then we can trace the shape and make a template (although there are now fancy rulers to replace many templates). Quilters will often have strong opinions about using templates. Until recently, as soon as I saw a template in a pattern, I skipped it! I was sure that cutting rectangles, squares or triangles was just much easier. Now I'm not so sure. In my Grandmother's Choice quilt I consciously stayed away from anything with a template. However, there were a few blocks that I wanted to make that required templates, such as block 48 representing Canadian suffrage. So, I gave the template blocks a try. After all, they're only 8 inch blocks - if they don't turn out, I don't have to use them in the final quilt! These blocks are more or less fine. Appliqué is just not my forte, but I will keep trying to get better! 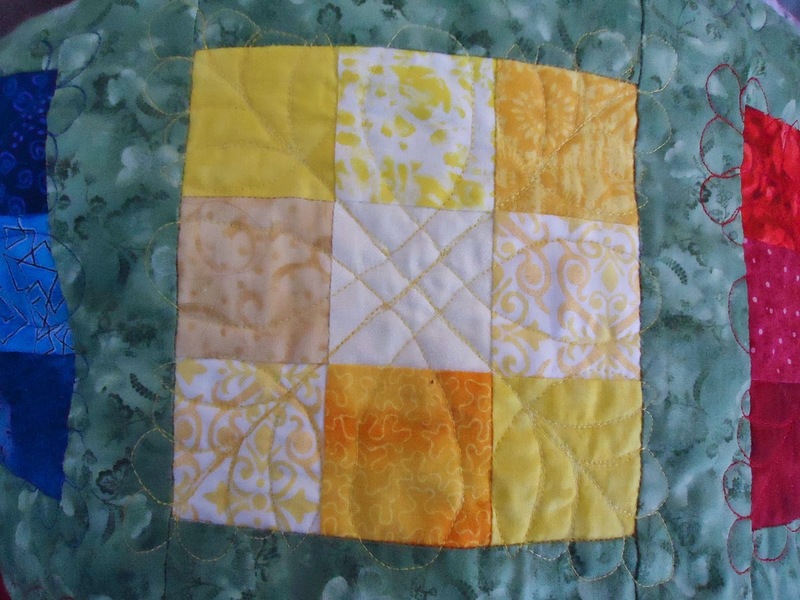 The good thing about appliqued blocks is that they will be quilted over, so that will help hide any little problems and keep them attached. Since I LOVE paper piecing, I decided to see if I could convert a template block into a paper pieced block. 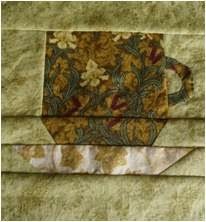 First of all, I read a couple of articles by Carol Doak, the queen of paper piecing. The first article is Piecingon Paper - Converting Traditional Designs to Paper-Foundation Patterns. 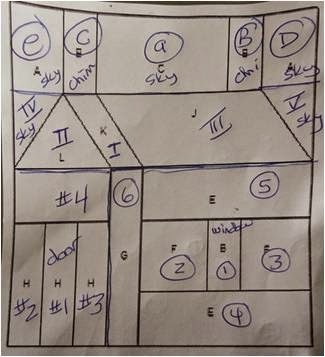 The second article is Piecing onPaper - Designing Your Own Blocks. 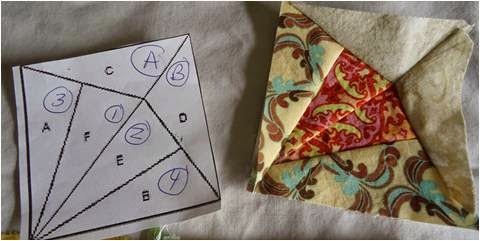 Between these two articles and experience paper piecing, it was simple enough to do. For the Little Red Schoolhouse block, converting it to paper piecing was mostly a matter of figuring out where to separate the sections. The only adjustments I had to make were to cut up the side section of the sky into two parts. I also had to add a border around the block since it was more like 7 inches. That was an error in photocopying the pattern. 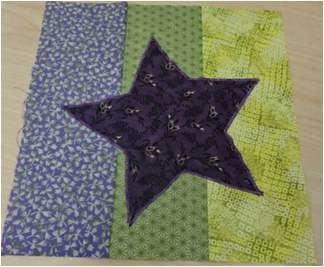 The Mother's Delight block looked easy enough but turned out to be very tricky to sew together. As you can see, I made a sample piece using scraps before trying the real thing. The tricky part was connecting the top part (A&B) to the bottom part (1,2,3,4). It involved what can either be called an inset or "Y" seam. Those can be difficult to sew, but when I googled Y seam to make sure that this is what it's called; I found a great tutorial by JennyBeyer. I may go back and redo this block - it'll depend on how ambitious I feel when I get back to this project. Templates are not always difficult to use. I'll try to be a little more open to doing projects with them from now on. Appliques are still difficult! I guess I need more practice. 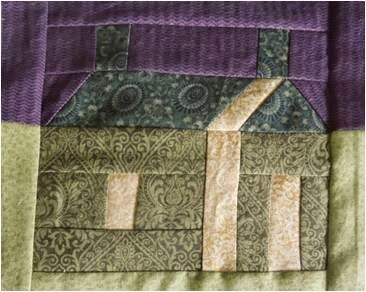 I was really happy to convert those two blocks to foundation paper piecing. 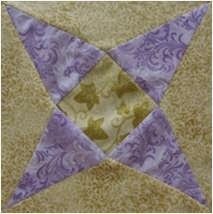 I think that for pieced blocks with many small pieces, paper piecing is a good option when possible. It was a good experience - now I know that I can do it. Next time, I might want to check out the internet tutorial BEFORE I finish the block.